The newer breed of single-stack 9mm handguns, epitomized by such weapons as the Smith and Wesson M&P Shield, Glock 43, and the Walther PPS, are all the rage among concealed carriers these days. Such handguns provide adequate shootability, sufficient ammunition capacity for general civilian needs, and prove very easy to carry. Civilian defenders rarely encounter the dedicated criminal element that police officers occasionally face. The vast majority of citizen force encounters end after the criminal becomes late for a different appointment once he sees a gun produced or takes incoming fire. If we just look at averages, a good single-stack 9mm handgun is a capable weapon for concealed carry. However, the problem with the entire statistics and probabilities argument is that they sound good until you find yourself an anomaly. I honestly have nothing against relatively small guns, I often carry a small-frame five-shot revolver when I need deep concealment, so I can hardly criticize carrying the even more formidable single-stack 9mm. I know a lot of macho guys who tout carrying only a full-size handgun, yet never actually have a gun on them. A smaller gun is still a formidable defensive weapon, but I find many people talk themselves out of trying to carry something larger and more capable before they give it a chance. 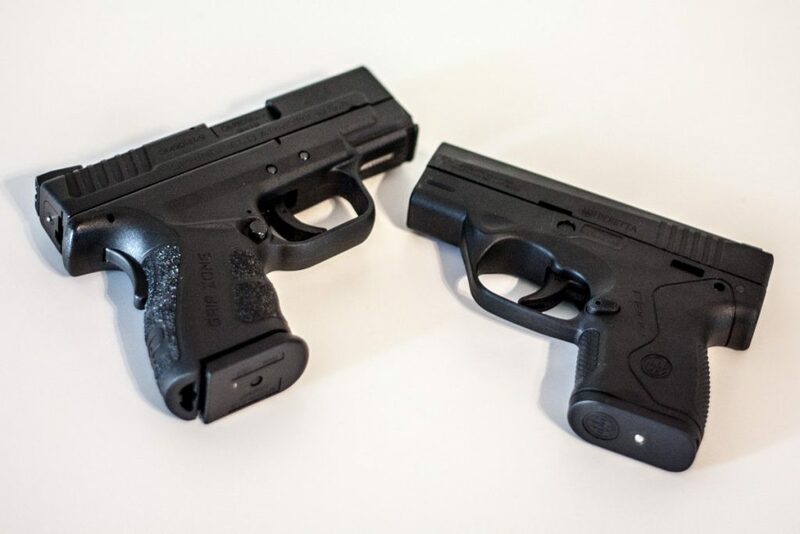 I am of the opinion that the weapon class that offers the most versatility and capability relative to feasible concealment is the double-stack compact or sub-compact models of handguns. Weapons like the Smith and Wesson M&P9c, the Glock 26, or the Sig p320 Sub-compact epitomize this selection. These are all chambered in 9mm, the ideal cartridge for such guns as it proves more controllable than the larger caliber service rounds and it also maximizes ammunition capacity. These guns are considerably smaller than their full-size counterparts, but they retain much of the capability. These days the gun I most often carry is the Glock 26. The compact size of the 26 gives up some performance compared to the full-size guns, especially if carried with the flush fitting magazine which leaves the pinky finger falling under the grip for most shooters. With good technique, however, this size of handgun is very capable. The M&P9 Compact is similar, even a bit larger than the Glock 26, and it offers two more rounds of capacity in the flush-fit magazine. The Glock 26 and M&P9 Compact both represent what I truly love about this format: they prove substantially easier to conceal than the full-size models, yet still prove very formidable. They provide significantly more on-board capacity than do the single-stack options, and they have one truly excellent advantage: they accept full-size magazines. I carry my Glock 26 with the flush-fit ten round magazine, but I carry a Magpul GL9 twenty-one round magazine as a reload. The Magpul Glock magazines have proven utterly reliable, but you should be wary of using after-market magazines in handguns as they can prove unreliable. The Glock 26 is compatible with the factory Glock 17 magazine, which provides seventeen rounds of ammunition as a reload. The M&P9 Compact holds twelve rounds in the flush-fit magazine, but can accept the standard M&P seventeen round magazine. This ability makes the compact double-stack gun much more versatile than a single-stack gun. You can carry with the flush-fit magazine for concealment, but you can leave it next to your bed at night with a full-size magazine making it a good home defense gun. When carrying a spare magazine as a reload I find that the extra height of the larger full-capacity magazines prove no hindrance and carry as easily as a spare compact magazine. This depends on how you carry your reload, of course. So why are single-stack 9mms all the rage if the double-stack compact has these advantages? The difference, of course, is the width. The double-stack model is wider to accommodate the higher-capacity staggered magazine. This width is essentially the deciding factor. For some people this width truly makes carrying the double-stack more difficult than a single-stack. However, the point I wish to make is that for many people the width difference is greatly exaggerated in their own mind. Depending on your body type and your mode of carry the width may make a substantial difference, or it may make no difference at all. I think many new concealed carriers talk themselves out of carrying a larger gun before they actually try it. For myself, the width makes little difference in my ability to conceal the gun. What makes the definitive difference, however, is the height of the grip, and many other concealed carriers find this to be the case. I find the Glock 26, for example, conceals better than the Glock 19 or Glock 17. However, the Glock 43, the single-stack version that is almost identical in dimensions to the 26 except for the fact that it is thinner, conceals roughly the same. The heel of the grip is what gives me trouble when concealing and the thinner gun offers no significant advantage. Therefore, why would I carry the smaller gun which offers less capacity and can’t accept full-size magazines? The Smith and Wesson M&P9 Compact is actually slightly shorter in the grip than the uber-popular single-stack M&P Shield and with the flush fit magazine the compact offers 12+1 rounds as opposed to the Shield’s flush fit magazine capacity of 7+1. If the width makes no difference in concealment for you there is no denying the difference in capability between the two weapons. If the thinner gun truly works better for you I completely respect that, but I think many simply never do the comparison in the first place. If you have not tried to conceal a double-stack compact, give it a go. Some people with small hands find the double-stack autos a bit big in the grip and actually prefer the smaller gun for shooting, so this is also a valid concern. However, a lot of new concealed carriers just automatically default to the smaller gun without actually comparing it to the concealability of the slightly larger but more capable double-stack compact. So, in closing, let me re-iterate that I believe the modern single-stack 9mm is a good concealed carry weapon and if it works well for you then you roam the world considerably well-armed and far more prepared than most people. However, if you are new to concealed carry my recommendation is to actually try the double-stack compact gun to see the difference first hand. If there is no appreciable difference in concealability I would argue that more bullets is always better! Combine that with the ability to accept a full-size reload, and a double-stack compact 9mm is a gun that is small enough for most to conceal but big enough to really fight with.